Joints Chief head says test shows Pyongyang becoming "increasingly belligerent"
WASHINGTON (CNN) -- President Obama castigated the North Korean government Monday for conducting a second nuclear bomb test in defiance of multiple international warnings. President Obama calls North Korea's nuclear test "a grave threat to the peace and stability of the world." North Korea's actions "pose a grave threat to the peace and stability of the world," Obama said at the White House. 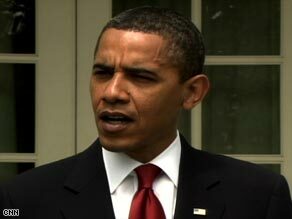 Obama promised that the United States and the international community would strongly respond to the test. North Korea's state news agency reported the nuclear detonation a little more than an hour after the U.S. Geological Survey reported a magnitude 4.7 seismic disturbance at the site of North Korea's first nuclear test, which occurred in October 2006. The state-run Korean Central News Agency said Monday's test was conducted "as part of the measures to bolster up its nuclear deterrent for self-defense in every way." In a one-two punch, the secretive communist state also apparently test-fired a short-range missile on Monday, the White House said. The U.N. Security Council is scheduled to meet at 4 p.m. ET Monday to discuss possible responses to North Korea's actions. In an earlier White House statement, Obama called Pyongyang's actions "a matter of grave concern to all nations." "By acting in blatant defiance of the United Nations Security Council, North Korea is directly and recklessly challenging the international community," the statement said. "North Korea's behavior increases tensions and undermines stability in Northeast Asia. Such provocations will only serve to deepen North Korea's isolation." The top-ranking U.S. military officer said Monday that North Korea's reported nuclear test is a primarily a diplomatic matter right now, not a military one. "I think it's really important ... right now to emphasize the diplomatic path," Adm. Mike Mullen, chairman of the Joint Chiefs of Staff, told CNN's "American Morning." "That's really the one they're on." "Obviously we've got forces deployed to that part of the world, we have had for a significant period of time, we've got over 25,000 troops who are stationed in South Korea," he added. "We've got very close alliances there with Japan and South Korea as well. ... The countries who are involved in [the six-party talks], I think, are absolutely critical as we move forward to address this increasingly belligerent challenge from North Korea." Mullen said the test did not come as a surprise to the United States. "We weren't surprised because of recent statements by North Korean leadership that they intended to do this," he said. "As you know, they also recently ... unsuccessfully launched potentially an intercontinental ballistic missile." He said the reported test shows Pyongyang is becoming "increasingly belligerent." Most other countries have denounced the test. Even China -- North Korea's strongest ally -- said it opposed the test. China's government "expresses firm opposition" to the test, in which North Korea "disregarded the opposition of the international community," according to a statement from China's Ministry of Foreign Affairs.